If you wanted to draw a diagram of frog anatomy you might be surprised at how many parts there are in that little amphibian. Frogs live on land most of the time, but they are amphibians because they are born in the water because the female frogs lay their eggs under water, and they start their life as tadpoles, which have gills and can only live under water. The anatomy of a tadpole is a tail, a mouth, and some gills until it begins to turn into a frog. 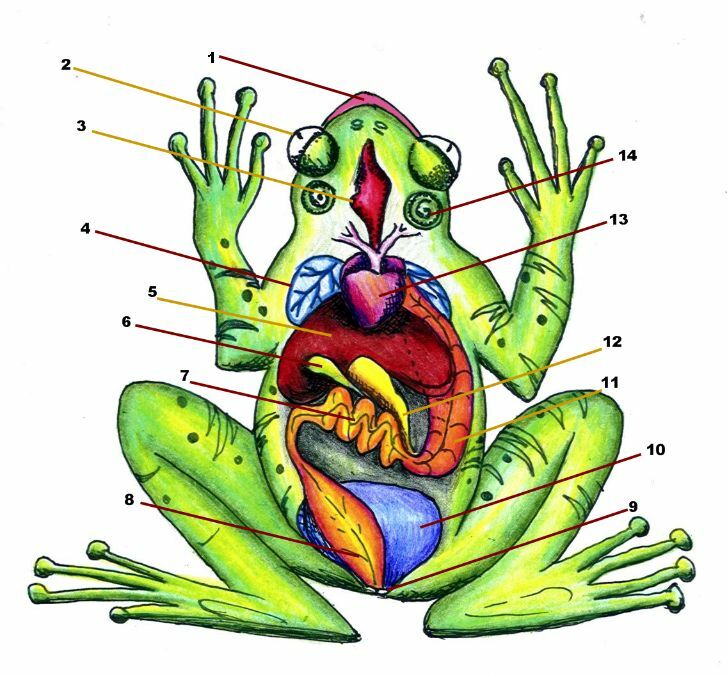 In order to correctly make a diagram of frog anatomy you could look at a biology book and find pictures of the inside of a frog, or you could do a frog dissection. Frog dissection sounds really gross, but once you get the frog opened it is really very cool. Inside the frog you will be able to see all of the frog anatomy for your diagram. When you are exploring the frog anatomy you will find things that you might recognize, like the frog’s heart, brain, lungs and intestines. But you will also find some surprising things out about frog anatomy like three eyelids on each eye. One of the eyelids is transparent, which means you can see right through it. The transparent eyelid is called the nictitating membrane. You will also find the frog’s stomach when you do a frog dissection. You will be able to open up the frog’s stomach and see what the frog has eaten recently. You might find the wing of a fly or even a whole insect inside the stomach. But most of what the frog has eaten will already be digested so you won’t be able to see that food during the frog dissection. Be careful not to mistake the frog’s food as part of the frog anatomy though. The intestines of the frog anatomy are really small compared to what you might think. If you have seen a diagram of human anatomy you know that the intestines look like a bunch of tubes that go on forever, but in frog anatomy the large intestine is one tube that kind of looks like a balloon that hasn’t been blown up all the way, and the small intestines look like a short tube that is just curved in a few places. Some of the tools you will need for a frog dissection are gloves, goggles and an apron, a dissecting needle, forceps, a dissecting tray, a plastic baggie and paper towels for clean up, and a pen and paper. Most importantly, you will need a teacher or other adult with you to do the frog dissection because the adult will need to use the scalpel to cut the frog open to start the frog dissection. Oh, and you can’t do a frog dissection to look at the frog anatomy for your diagram of frog anatomy without the frog, can you?